The victorious ‘Indian Wheelchair Cricket Team’ met Union Minister for Social Justice and Empowerment Shri Thaawarchand Gehlot in his office here today. The Indian Wheelchair Cricket team beat Bangladesh in three-matches Wheelchair Cricket Series 2018 by 2-0 held at University of Dhaka stadium, Dhaka, Bangladesh. 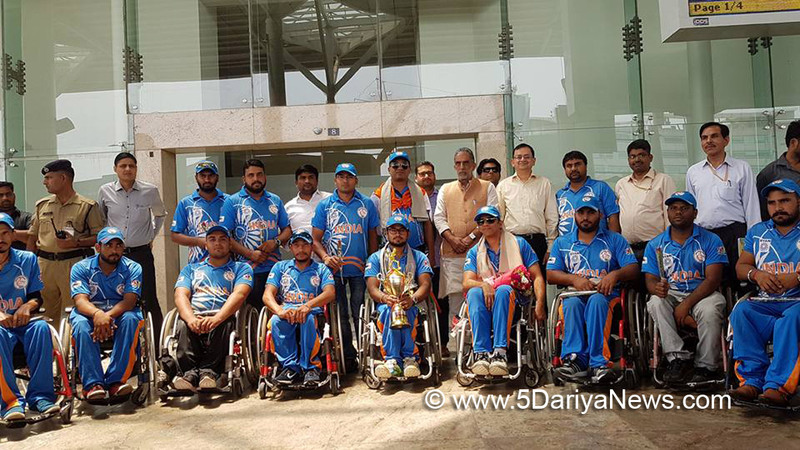 Shri Gehlot tweeted, “The Indian Wheelchair Cricket Warriors outshine Bangladesh in the 2nd International T-20 Wheelchair Cricket Match Series at Dhaka. My best wishes to team India and the organizers Wheelchair Cricket India Association on this wonderful victory.”Earlier, the team was felicitated by Minister of State for Social Justice and Empowerment Shri Krishan Pal Gurjar at New Delhi airport who presented them flowers and shawls. Welcoming the Indian Wheelchair Cricket team, Shri Gurjar said that the ssssGovernment is committed to the empowerment of Persons with Disabilities.The Indian Wheelchair Cricket team beat Bangladesh by 10 runs in the final match against Bangladesh at University of Dhaka Stadium, Dhaka, Bangladesh on Monday. India set a target of 153 runs for Bangladesh in a limited overs format. However, the host team could score only 143 runs in 15 overs. Rohit Manhotra bagged the Man of the Match and Man of the Series titles. The trophy was presented to skipper Somjeet Singh in a glittering ceremony.The tournament was first of its kind and it not only inculcated a positive attitude among Persons with Disabilities but also provided a platform to show case their talent and physical abilities.The names of Indian Wheelchair Cricket are: Mr. Somjeet Singh (Captain), Mr. Abhai Pratap Singh (Vice Captain), Mr. Veer Singh Sandhu, Mr. Rohit Annotra, Mr. Surendra Kasare, Mr. Sukhwant Singh, Mr. Ramesh Kumar, Mr. Jeyan Alt, Mr. Anmol Vasistha, Mr. Vikky Kumar (Wicket Keeper), Mr. Gaurav Yadav, Mr. Sunil Rao, Mr. Bhima Lakhaman Khunti and Mr. Jagroop Singh.The Joint Secretary, DEPwD, Dr. Prabodh Seth; Director, DEPwD, Shri Vikash Prasad and General Secretary of Indian Wheelchair Cricket team Shri Pradeep Raj were also present at the felicitating ceremony held at the New Delhi Airport.